Roofing Superstore is proud to offer a range of products in the Vistalux 3 inch profile PVC sheets category, with a heavy duty profile. The Vistalux range comes from Ariel Plastics, a market leader in the production of roofing sheets, rooflights and roof accessories in the UK, with years of experience in creating innovative alternatives to traditional roofing products. What are heavy duty Vistalux PVC sheets? 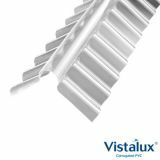 The heavy duty form of Vistalux’s standard 3 inch profile PVC corrugated sheets has been designed to add more strength and reinforcement to the PVC corrugated sheets. The 3 inch corrugated profile has been designed to match the standard asbestos roof sheet profile, meaning that it can be used for repairs, replacement or to create a whole new roof. Where are heavy duty Vistalux roof sheets used? Vistalux heavy duty roof sheets can be used in a wide range of different applications. The heavy duty aspect means that they can be used on larger projects without worrying about compromising on strength and stability, but Vistalux heavy duty roof sheets are most commonly used in small domestic projects such as porches, car ports, outbuildings, garden sheds, lean to extensions and more. What are the benefits of heavy duty Vistalux roof sheets? There are a number of benefits to using heavy duty Vistalux roof sheets in place of more traditional roofing materials. Firstly, the PVC roof sheets are lightweight, meaning that they are easier to handle and transport, as well as install. Additionally, the heavy duty roof sheets are much larger than more traditional roof tiles or shingles, meaning less are required to cover the roof, reducing installation times. The PVC heavy duty roof sheets have been manufactured to add extra strength, impact resistance and stability to normal PVC roof sheets. This means that they can be used in larger projects as well as smaller domestic projects, so they have a broad appeal. Another benefit of using heavy duty PVC sheets from Vistalux is that the sheet allows 3 times as much natural light to pass through into the building than a piece of vertical glazing that is the same size, increasing the amount of natural daylight and reducing the amount of artificial light that is required to create a bright environment. PVC roof sheets for Vistalux also come with a 10 year warranty, meaning that if the roof sheet fails due to a manufacturing defect within 10 years of purchase, a new product will be sent out free of charge, as long as the manufacturer’s installation instructions have been followed. This provides the customer with peace of mind that the roof sheets have been built to last. PVC sheets from Vistalux are also self-extinguishing, meaning that in the event of a fire, the PVC material will melt away from the flames, and stop as soon as the source of the flames have been removed. If you have any questions about the heavy duty PVC sheets from Vistalux, or want to know more, don’t hesitate to call our team on 01752 692760 or use the live chat and they will be more than happy to help out.